I'm not sure when it started, but my older son became very curious about what his body looked like inside. I showed him a few pictures of bones and muscles online, and then for his birthday, we gave him the Usborne See Inside Your Body lift-a-flap book (by Katie Daynes). Though it is a bit much to sit through the whole book start to finish, we read a page or two at a time, and he really enjoys it. 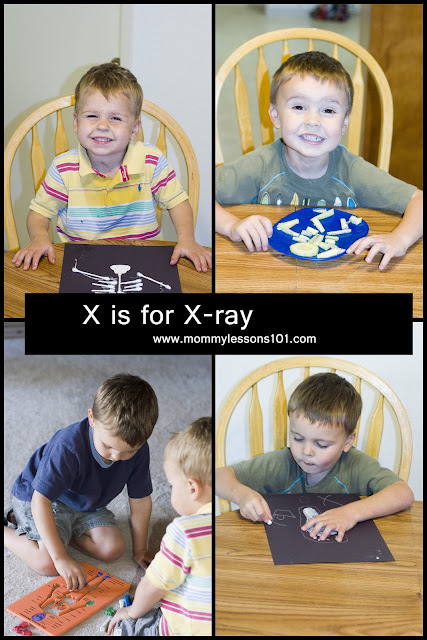 We have also been playing a lot with our pretend doctor kit, and so my kids were excited when we did the theme of "X is for X-ray" for the letter X. During this unit, we talked about many different aspects of our bodies--both inside and out. There are so many different directions you could go when talking about the human body. We started by doing a simple "All About Me" book from this human body unit. Then, we skipped around to topics such as healthy eating, bones, muscles, and doctors. We could have gone into depth with any one of those topics alone, but I tried to follow my kids' interests as we chose a mixture of body-related activities. During this unit we focused on the sound of the letter X. Not many words start with the letter X, so I challenged my kids to think of words that end with the letter "X" such as ox, fox, box, mix, six, etc. We watched the Starfall letter X sequence. My kids love the Starfall website! We also practiced writing the letter X. I found a great resource for teaching about the human body at the blog Spell Outloud. From there, we downloaded a letter X for X-ray tracing page (and we also did some of the other activities the author had found such doing a giant toddler skeleton puzzle and then singing the "bone bounce" song). To further practice writing the letter X, I taught my kids how to play tic-tac-toe, and we played it a lot with sidewalk chalk and on our dry-erase board. My younger son LOVES monkeys and Curious George, so this book was a perfect fit for this unit. In the book, George eats a puzzle piece and has to go to the hospital and get an x-ray. Even at the hospital he is as fun and mischievous as ever. Parts (Picture Puffins) by Tedd Arnold. This was a funny book about a boy who thinks he is falling apart. We were all laughing as we read it. My four-year-old son really does worry a lot about his teeth falling out when he is older and he has panicked at the sight of blood because he doesn't want his blood to "fall out." So this was a good book for him to read and remember that he is "normal." We read this book, and we also watched a video of the song and sang and danced along! My kids loved that. From Head to Toe Big Book by Eric Carle. This book is about different kinds of animals--not people, but it was a good active book as we used our bodies to try to mimic the actions in the book. We connected this to our theme by talking about all the amazing ways our bodies can move. For a math activity, we did the band-aid counting activity from this adorable Doctor & Nurse preschool pack. Be sure to check out the whole preschool pack for other cute doctor-related activities. We talked about taking care of our bodies to keep them healthy--such as eating healthy and washing hands.. When talking about eating healthy, we listened to My Body Machine. This book/CD set also has a song that has intro to all the different systems of the body--circulatory, pulmonary, etc. I actually sang on this CD as a child--I was the role of "Shiny Brite"--so my kids loved it when I told them that the little girl who was speaking and talking was me. When talking about handwashing and germs, we read the book Germs are Not for Sharing by Elizabeth Verdick. Then, we did this hands-on activity to see the importance of washing our hands, using tissues, and sneezing into our elbows. The kids thought it was hilarious when I "sneezed" water from a spray bottle onto them. Most science museums have an exhibit on the human body. I love the both the Discovery Science Center and California Science Center in southern California. 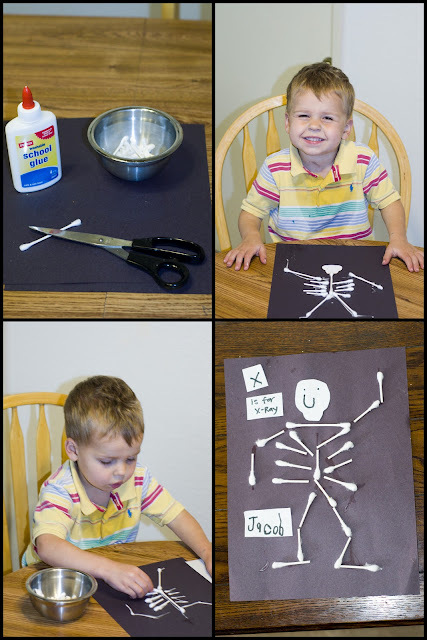 Our first craft was Q-Tip Skeletons. I put the glue down for my boys to make it a bit easier. Then, they put on the q-tips and drew the eyes on the skulls. My older son also wrote a letter X and his name that we glued onto the page. I did the letter and name for my 2-year-old. And then, we did these cute handprint X-Rays. I painted my kids' hands and feet white. 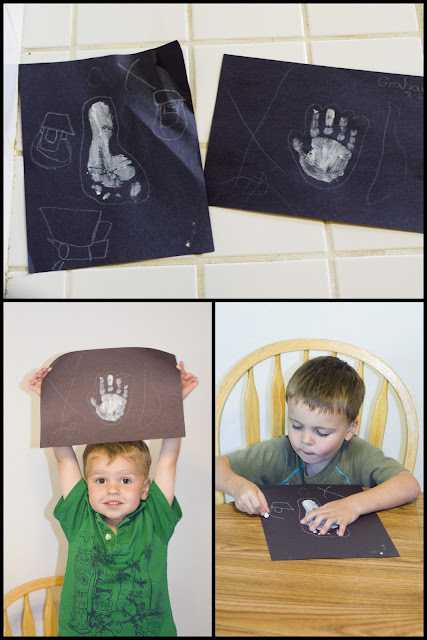 Then we pressed their hands/feet on black paper and traced around them with white crayons. Of course, we played with our pretend doctor kit a lot! My kids loved taking turns being patients and doctors, and even treated their stuffed animals when needed. We also added to our a doctor kit a homemade light table and "x-rays" that we made. To make a homemade light table, I bought a small clear storage box. I then put battery operated push button lights in the box. Finally, I put waxed paper on top to diffuse the light somewhat. For the "x-rays" we drew our own designs on clear overhead transparencies. 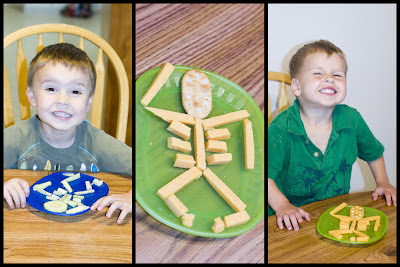 We turned our snacks into skeletons. 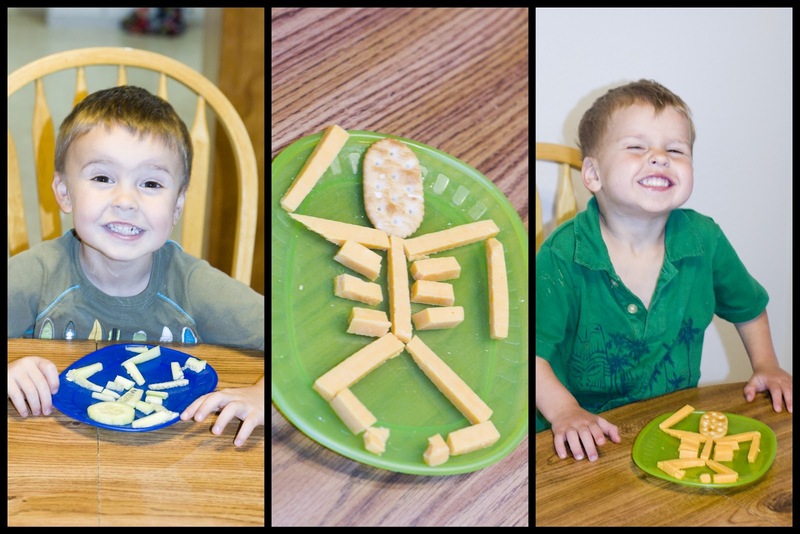 I used my kids' favorite snack foods--cheese sticks for and a cracker for one of my sons, and a cut up cucumber for my other son. In addition to the "The Bone Bounce" and "Dem Bones" that I mentioned above, we song other simple songs about the body such as "I'm all Made of Hinges" and "Head, Shoulders, Knees, and Toes." For an active game, we played some music which I would periodically freeze and then the kids would choose a fun pose to freeze in. We tried forming letters and shapes with our bodies, and we worked on somersaults, marching, skipping, and more as we talked about all of the amazing things our bodies can do. I was also lucky enough to find a skeleton puzzle in the dollar bin at Staples. My kids enjoyed doing this small foam puzzle. I also found a few other fun ideas for this theme and pinned them on my X is for X-ray Pinterest Board, so go check that out, too!